The spear shaped Taiaha is the best known of the Maori weapons. Here in the store it is regularly mistaken for a spear. In reality this couldn’t be further from the truth. The Taiaha was never made for throwing. It varied considerably in length from 1.2 to 1.9 meters and was made from a light wood or sometimes even whale bone. It is best described best in three sections. The first is Rau, or long striking blade usually between 6 and 7cm wide. Second is the shaft which is oval in cross section. Last is the Proximal end, with an arero or tongue extending out from the mouth in the Maori gesture of defiance. The arero formed the extreme end of the weapon. When advancing to engage an opponent a warrior often assumed a guard, with the Taiaha held either vertically or slightly diagonally across the body, the blade uppermost and the arero facing the ground. During fighting, feints and passes were constantly employed, and experienced fighters continually repositioned themselves hoping to detect an opening for a strike. All the while guarding themselves against an attack. A favoured ploy was to feint an attack on an enemy's torso or face with the tongue end of the Taiaha, then when the opponent recoiled, reverse arms and strike at the top of his skull with the edge of the Rau. Such a blow could cave in the top of a skull and kill instantly. We have a blow up photo of our Taiaha so that you can use the scroll bar at the bottom of the picture to scroll along the full length of the Taiaha. Depending on your operating system you may have to prevent Windows from fitting the whole picture into one window by clicking on the full size "ball" that appears when you hover over the picture. The Wahaika was a short weapon used for close quarter fighting only, with thrusts and jabs. It is believed the small ridge on the blade side was to trap the opponents weapon thereby disarming him. They were held at the end by a thong of dogs skin looped through the handle and securely around the hand. The Kotiate were prized weapons on the battlefield, as well as being favored by many chiefs during speech making. The Kotiate is an unusual weapon, but very unique and very dangerous. It has two deep notches on either side. It was traditionally made from wood or stone. In combat a warrior would thrust it into the abdomen of his adversary and twist it. The notches on either side would become entangled in the intestines and as it was removed the damage would almost always be fatal. This was a long handled club weapon with a heavy axe like blade at one end. Like the Taiaha it was not used as expected. It was used to parry and thrust until a solid blow could disable the opponent. Then it would be used like an axe to kill the enemy. Today the Tewha Tewha is used formal ceremonies only. 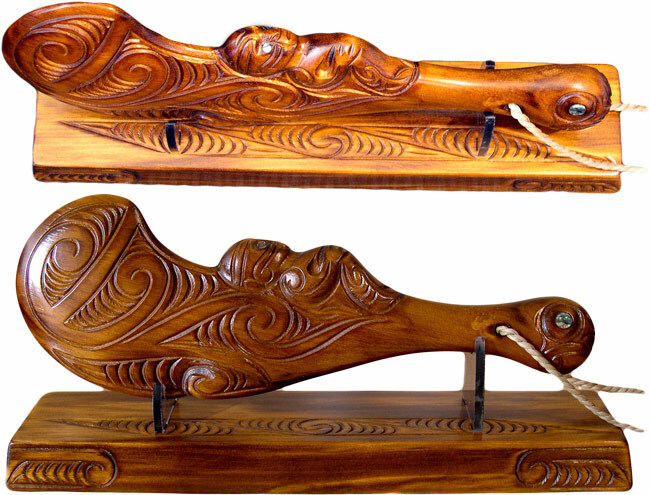 Patu's or Mere's were made from Bone, stone or wood. Warriors using these weapons in battle relied heavily on quick footwork and agility. Typical strike zones for warriors included the temple, the jaw and the ribs. In each case the leading edge of the weapon was used, rather than a downward clubbing action. A secondary development was the introduction of a hole to accommodate the wrist chord, which became necessary to stop blood or sweat drenched hand slipping up the weapon during the thrust. The more prestigious patu's were made from greenstone. These were usually called Mere's.